Competition in Europe's biggest leagues is being "destroyed" by clubs who have "huge financial power", says Arsenal boss Arsene Wenger. Frenchman Wenger pointed to examples in France, Germany, England and Spain. Paris St-Germain are 11 points clear in Ligue 1, Bayern Munich have a 16-point advantage in the Bundesliga and Manchester City are 15 points ahead at the top of the Premier League. Wenger said it was clear that "unpredictability has gone down". He added: "When you look at the five big leagues in Europe, in December we already knew four champions. "That means something is not right in our game. The huge financial power of some clubs is basically destroying the competition." In Spain, Barcelona have an 11-point lead over Atletico Madrid. Defending champions Real Madrid - suffering a surprisingly difficult season - are 19 points behind Barca in fourth place. The other league that usually figures in Europe's 'top five' is Italy - where Napoli are a point ahead of Juventus, title winners in the past six seasons. 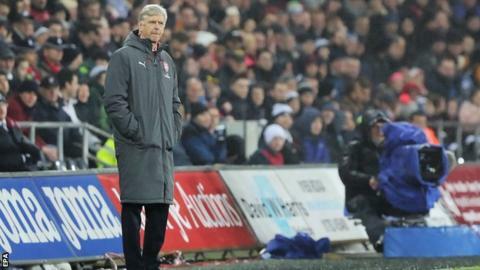 Frenchman Wenger was speaking two days after transfer spending in the Premier League again reached record levels. Clubs in England's top flight spent £150m on Wednesday - the closing day of the winter transfer window - taking their outlay for the month to £430m. Following the close of the summer transfer window in September, Wenger said Uefa's Financial Fair Play rules - introduced to prevent so-called 'financial doping' - should be scrapped because clubs are "not respecting" them. PSG more than doubled the world record transfer fee when they bought Neymar from Barcelona last summer, also signing Kylian Mbappe on loan in a deal that is expected to see him join for £165.7m at the end of the season. Manchester City were accused of 'financial doping' by La Liga president Javier Tebas, who also said PSG were "laughing at the system" with their summer buys. This January, Premier League clubs' spending far outweighed that of their European counterparts, despite La Liga side Barcelona paying the biggest fee of the January window when they bought Brazil playmaker Philippe Coutinho from Liverpool in a deal that could be worth £142m. The Bundesliga has been dominated by Bayern Munich in recent years - the Bavarians winning 12 of the past 18 titles, including the past five in a row. Only once in the past 13 seasons has the Spanish title been won by a club other than Real Madrid or Barcelona - Atletico Madrid in 2014. Barca have won the league eight times in that period, with Madrid claiming four titles. In Italy, Juventus have won Serie A for the past six seasons in a row, while Inter Milan claimed five titles between 2006 and 2010. In France, there were six different title winners between 2007-08 and 2012-13, but PSG have won the league in four of the past five seasons. Between 2002 and 2008, Lyon won seven Ligue 1 titles in a row. In the Premier League, only four clubs - Chelsea, Manchester United, Manchester City and Leicester - have won the league in the past 12 seasons. Since it was established in 1992, only six clubs have won it - with Blackburn Rovers and Arsenal the other two clubs to have claimed the title.